These two releases were sent from a different domain (eg-gc.ca) from the first two (enviro-canada.ca), and they looked somewhat more official. OTTAWA, Ont. 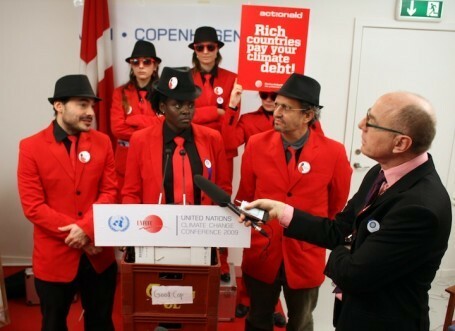 -- December 14, 2009 -- One hour ago, a spoof press release targeted Canada in order to generate hurtful rumors and mislead the Conference of Parties on Canada's positions on climate change, and to damage Canada's standing with the international business community. Unfortunately, the spoof release was reported in major international outlets. The Office of the Environment Minister and Environment Canada confirm that this release and all statements within it are unequivocally false. Worse, they risk heavily damaging the negotiating process. Canada wishes to fully expose these efforts for the irresponsible deceit they represent, and shall seek the full measure of legal recourse against these criminals under Danish and international law. "Without the dynamism of our oil sands industry," says Bruce Carson, a special Adviser to Environment Canada, "we in Canada would not have the energy - moral, financial and literal - to develop the alternative energy future the whole world craves." "Canada's line may not always be popular, but we do feel the scientific and political assumptions we've inherited from the Kyoto Protocol no longer suit present physical or market realities, or a vigorous energy policy into the future," notes Michael Martin, Canada's chief negotiator in Copenhagen. "A 2006 baseline for emissions reduction targets, and a comprehensive re-examination of finance for developing countries in the context of a generous and efficient foreign-aid policy package, will guarantee an efficient, direct path to useful negotiations within our increasingly fast-paced energy market." 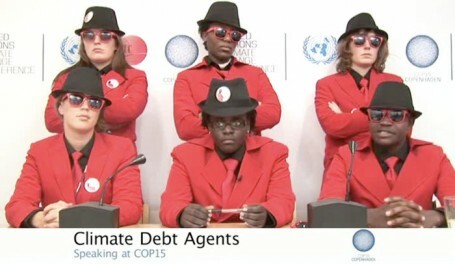 The Canadian government wishes to note that in addition to misleading the world on Canada's energy stance, today's impostors generated a cascading series of hopes that culminated in the delivery, by the Ugandan delegation, of an impassioned speech in today's COP-15 press briefing. "It is the height of cruelty, hypocrisy, and immorality to infuse with false hopes the spirit of people who are already, and will additionally, bear the brunt of climate change's terrible human effects," said Jim Prentice, Canada's Minister for the Environment. "Canada deplores this moral misfire, while remaining confident in her critical role in the arena of the UNFCCC, and of the world. Canada continues to seek dynamic new energy solutions every year, and its energy development research is second to none. As for Canada's role on the international stage, it remains vibrant, strong, and appreciated by our numerous partners." Today's stunt, with its short-sighted, unrealistic policy ideas and brutal disregard for the oppressed, should distract no one from the serious, energetic, and meaningful commitment of Canada to a shared sustainable future on this planet, which will guarantee all nations their due portion in accord with historical norms. This sophisticated operation was reported in the Toronto Star, The Globe and Mail, and a number of other outlets as the irresponsible spoof that it was. Environment Canada wishes to stress that the Ugandan delegation's impassioned response to the announcement is a dramatic tragedy for those who stand to suffer the most. "It is the height of cruelty, hypocrisy, and immorality to infuse with false hopes the spirit of people who are already, and will additionally, bear the brunt of climate change's terrible human effects," said Jim Prentice, Canada's Minister for the Environment.